We sat staring into our bowls of spicy wet noodles almost unable to hear due to the deafening sound of horns and motorbikes. We were all aware of our geographical position but never the less were still in a daze of disbelief. Bustling crowds of people were moving almost in ranks like and advancing Roman Army passing the seedy little Café where we sat. Shadowed by constant smog, which covered the whole city, the voice of a woman riding past on her bicycle pierced our thoughts with the words "bang me now", "bang me now". Smirks grew into beaming smiles before laughter broke. Our guide managed to get our attention before we buckled and explained that "bang me now" was fresh bread in Vietnamese. The smiles never broke. As the humour subsided, the reality took hold - we were in Hanoi, Vietnam. The dream had begun after reading an article about motorcycling in Vietnam, an article published by FHM. The article finished with contacts for the tour in the form of an email. After a few beers in the Pario Bar, myself (Mark Plaxton), Geordie Cahill and Jaffa Jeffs decided that this trip had our names written all over it. After about 15 days and as many emails we finally received a reply . It was filled with all the information we had asked for, and more. We sat down over a beer or two and decided there and then to go ahead and do it. Having gained permission from DCOC (Domestic Chief of Staff "The Wife"), we went to work the next day and applied for leave. Within days our flights were booked. The adventure began in Brunei where we were tall stationed within Brunei Garrison. We travelled to Hanoi via Singapore and Ho Chi Minh City. We arrived in Hanoi and took a taxi to the hotel. That night we had thought it would be sensible to go to bead early ready for our big adventure although we all know it never happens like that. We rolled back to the hotel in the early hours from Hanoi's most prestigious night-club, believe it or not called the Apocalypse Now. The next morning at around 9.00 am and with rather sore heads we hit the city for our last western meal, as now the dream had turned to reality, we were about to embark on our journey north around Vietnam. For the next six days, food would be low on the priority list. We spent the next half an hour weaving in and out of cars and motorcycles whilst gradually exiting the city. Soon we were free of the chaotic roads of Hanoi and we were on our way. The further from Hanoi the more the mechanised modes of transport dwindled. After a few hours, we began to climb up through the hills of northern Vietnam, riding through gorges and valleys. To describe the scenes is difficult and to capture its beauty on camera was impossible. This was our Garden of Eden. We would all stop together and occasionally drift apart to spend a couple of hours not seeing each other. At times, it appeared that there was no one else in Vietnam. Standing in silence we looked down though the valleys of man made shelves of rice fields, a simple but effective system of irrigation. We could only imaging the work and effort it must have taken to produce such a view. 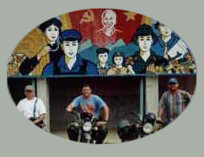 We spent around six to eight hours a day travelling on the bikes, during which we the awesome endurance of the Vietnamese Mountain people. They would walk for miles up and down the mountain roads and tracks with no obvious destination in sight, carrying a pole across their backs, with a basket on each end of the pole containing chickens and or pigs. We swam in lakes and rivers before encountering the awesome scenery and ice cold fresh water of the Ban Gioc Waterfall. This lies on the northern border between Vietnam and China. Fortunately, the weather was kind enough to allow us to swim below its 50 meter high drop over on the Chinese side of the spectacular natural landmark. Most of all we were treated with nothing but respect and kindness by the people, some of whom had never met anyone of the west and other who had only met on the field of battle during what the Vietnamese people call "The American War". For most of the time we ate in the local houses and we were always made most welcome. The food was by far the freshest we had ever seen of for that matter eaten as everything was transported live and slaughtered to order. This was the only system available as there wasn't any form of refrigeration. We spent six days travelling around the north-eastern areas of Vietnam finally returning to Hanoi. We celebrated that evening with some western style food and a few beers recounting our adventure. Over all other undertakings, this trip we agreed was the most amazing and fascinating trip we have ever undertaken.